You've been on a night out with a couple of friends; had a good time and a "couple" of drinks, and now you're back home thinking about what you can do to wind down the night. You notice your computer in the corner and remember that you've still got a bit of money left in your Full Tilt account. You've had a little bit more to drink than you expected but no matter, you're in a pretty good frame of mind to outplay some fish and add a little padding to your bankroll to give yourself a nice surprise for when you log into your account in the morning. You sit down at one of the 6-max tables with the least players sitting at it, this way you can get some more direct action with the donks so that you can outplay them more effectively and pull off a couple of nice advanced plays against them. The first 10 minutes or so go pretty well, you haven't lost or won anything substantial yet but it's still early days. A few minutes on things are getting pretty dull so you try a few special moves to get things going and start some action. The next thing you know you are re-raising your opponents' bets with air, and before long you're all-in hoping for that magical 8 to fall with a gut-shot straight draw against an opponent who has flopped top two-pair. 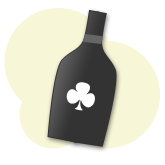 You are far more susceptible to tilt when playing poker drunk. Loose inhibitions + tilt never work out well. The problem with playing poker drunk. The fact of the matter is, alcohol has the fantastic ability to give you the feeling of indestructibility along with increased levels of confidence, which are best left at the door when it comes to playing poker. Every time I have sat down at the poker table after having a couple of drinks, I have sat down with the intention of playing out of my skin, playing the best poker of my life and making incredible reads to pick up some big pots to line my bankroll. But after a couple of hands my play starts to deteriorate, and I start to make plays for the sake of making plays without any regard for what the correct strategy should be. I'm out to win pots rather than money, and every drunken online session turns out to be pretty -EV. After admitting my own faults about playing drunken poker, it's going to be pretty hard to tell you to never play poker drunk. But nonetheless, drinking alcohol and playing poker is always going to be –EV, no matter how confident you are about your ability. Poker is a mentally demanding game, and you need to be on top form to analyse every play and make the most profitable decisions in every situation. Your sober state is your peak, and every drink you have just brings your focus down below your peak, reducing your ability to play the more you drink. So in general, to make the most out of every session you play, you want to be at the top of your game – sober and focused. The solution? A little self control (or just prepare to lose). Playing poker under the influence may well be one of the biggest contributing factors to why you lose money playing online poker. There is no one that is going to stop you from playing whilst you are drunk, so just be prepared to lose rather than win. There have been occasions when I have won a bit of money whilst under the influence of alcohol, but the majority of the time the drunken sessions are losing ones. I've looked back at hand histories in the mornings and laughed at some of the plays that I've made the night before. It's pretty obvious that it takes quite a bit of liquid confidence to check raise all in on the turn with middle pair against a tight player that has been betting heavily on the flop and turn. If you can't excercise a little self control, be prepared to lose money. It's as simple as that. So in a nutshell, if you really don't want to chip away at your bankroll every Friday or Saturday night, watch some re-runs of high-stakes poker, have some toast with a glass of water and leave the computer alone the next time you stumble home looking for a little late night entertainment. Your bankroll will thank you in the morning.